As sad as it may be, you cannot escape getting older. 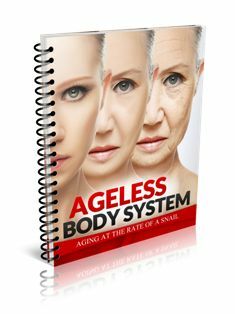 However, if you follow certain laws, described in the book Ageless Body System, you might be able to put off aging. As you are downloading the book using the link at the bottom of the page, please read the following suggestions that will help you look younger than you are. Buy a bike and take it out for a spin in your favorite childhood spots. Find a young lover. You will constantly be disciplined by your desire to look as good as him. If you’re not that old, you can find someone younger and will be able to feel youthful yourself. Start losing weight. In time, everyone is faced with a choice between their face and their body. It is very difficult to keep your face looking young without the help of plastic surgery and/or cosmetology. Keeping your body fit is a lot easier. Don’t eat after six. Remember the words of Tom Ford – after 40 years of age, only plebeians and peasants eat after 6. Stop being jealous. “Black” and “white” envy only ages you. Sleep for 8 hours a day. Enjoy spending money. As much as hair in your ears is a sign of again, so is saving up money for a rainy day. Learn to accept compliments without hesitation and excuses. It is better to discreetly thank them. Go on vacation at least twice a year, hopefully somewhere where there is a beach. Don’t stop learning. A person who is only interested in himself can barely talk about anything except his or her own ailments. Be excited about all the little things and nonsense in your life. Get excited about the good weather, green grass, and birds singing. Do not think that bathing in luxury is a guarantee of comfort and happiness. The best guarantor of long youth is comfort in simplicity. Stop complaining, especially about your life. Don’t admit your fears, don’t say “I’m afraid”, even if it’s translated from another language. If you suddenly need to leave in the middle of the night, leave. You can sleep through work, but you can’t sleep through life. Don’t believe in conspiracies, those theories are flawed. Try to be lighter. Stop weighing things all the time, overthinking them and mulling them over. Start acting. Remember what Napoleon said about battles – just get in there and the rest will sort itself out. Yes, Napoleon’s life wasn’t too great, but we still remember and consider him great. Gift flowers without a reason. Don’t be embarrassed to send silly messages, calling the recipient bunny, darling, or babe. Including a smiley would be too much, but that’s alright. Let children teach you to laugh. Watch cartoons, especially “Ice Age”. Live like a bird – worry only about today. Don’t worry about the past or the future. If there’s a day, there’s food. Watch your posture, don’t slouch.